Don Liuzzi was born and raised in Weymouth, Massachusetts, and completed high school in Philadelphia at the Franklin Learning Center. He earned his Bachelor of Music degree from the University of Michigan and his Master of Music degree from Temple University. His primary teachers were Alan Abel, Charles Owen, and John Soroka. Before joining The Philadelphia Orchestra in 1989, Mr. Liuzzi was a member of the Pittsburgh Symphony percussion section from 1982 to 1989. While in Pittsburgh he taught percussion and conducted the percussion ensemble at Duquesne University, was assistant conductor of the Three Rivers Young Peoples Orchestra, and appeared on PBS' nationally syndicated Mr. Roger's Neighborhood, performing marimba and percussion solos. Beyond his over 60 commercial recordings as principal timpani of The Philadelphia Orchestra, Mr. Liuzzi can be heard on several Decca releases with Seiji Ozawa's Saito Kinen Festival Orchestra, with which he has been a guest timpanist for five seasons. As a former percussionist with the Network for New Music, and also for area composers, he has recorded contemporary chamber works for the CRI, Crystal, and Albany labels. His percussion solo and chamber CD release from 2012, Movement in Time (Equilibrium), is volume I of the Philadelphia Percussion Project. This first volume features music by Maurice Wright, Maurice Rissman, and William Kraft. Volume II, Zones, was released in May 2015 and is a Philadelphia Orchestra percussion group (POPG) recording featuring Jennifer Higdon's Zones, as well as six other world premiere recordings including his own composition, Seoul Spirit. A participating musician in the documentary film Music from the Inside Out (2005), Mr. Liuzzi also served as the film's coordinating producer and was integral in helping develop the accompanying middle school teaching curriculum published by Alfred Books. The feature length film by Anker Productions, which features The Philadelphia Orchestra, was re-released digitally on iTunes in June 2013 and is also available on Netflix. Mr. Liuzzi's other electronic media activity (under his company name of Beat the Drum Entertainment, Inc.) has included two other CD projects with the DePue Brothers Band: performing drums and singing, and executive producing Weapons of Grass Construction and their latest album, When It's Christmas Time, released in December 2013. Mr. Liuzzi has given master classes at most major music schools throughout the United States and in Canada, Mexico, Argentina, Spain, Korea, Japan, and China. He has been a percussion and timpani coach at the National Orchestral Institute, the New World Symphony, the Pacific Music Festival, the Canton International Summer Music Academy, the Lindenbaum Music Festival (in Korea), the Youth Orchestra of the Americas, and the National Youth Orchestra USA run by Carnegie Hall. 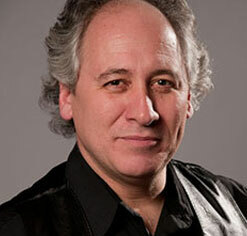 He joined the faculty of the Curtis Institute of Music in January 1994. 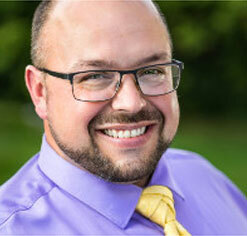 He has also held faculty positions at Rowan University and guest faculty status at Indiana University of Pennsylvania and the Manhattan School of Music. Mr. Liuzzi just completed 10 years as music director of the Philadelphia All City High School Orchestra, and is founding conductor of the Curtis Institute's 20-21 New Music Ensemble. Mr. Liuzzi's early orchestral experience included the Flint Symphony, the Michigan Opera Theater Orchestra, and the Colorado Philharmonic. He has also played in the Spoleto Festival Orchestra for three seasons and was a Tanglewood Fellow in 1980. In July 1996 he made his solo debut with The Philadelphia Orchestra at the Mann Center for the Performing Arts, and his subscription solo debut in January 1998. Having consulted with Yamaha for over 15 years on the development of professional timpani, he is now a Yamaha performing artist, with a highly-regarded YouTube solo appearance and interview through his Yamaha affiliation. He is married with two adult daughters. 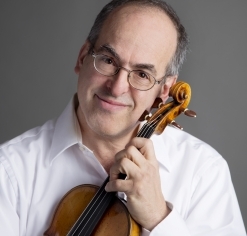 Violinist Paul Arnold has been a member of The Philadelphia Orchestra for 30 years and is a familiar personality on the Philadelphia classical music scene. He has appeared as a recitalist and chamber musician with such diverse personalities as Yefim Bronfman, Christoph Eschenbach, Tan Dun, Keith Jarrett, the New Arts Trio, and the Emerson Quartet. Mr. Arnold has appeared numerous times in the Saratoga Chamber Music Series, where he has worked beside Martha Argerich, Gil Shaham, Truls Mørk, and Sarah Chang. Mr. Arnold was also featured over 25 times in The Philadelphia Orchestra’s Chamber Music Series and Orchestra Postlude Recitals, performing widely contrasting repertoire. Mr. Arnold gives master classes around the country. He has most recently given classes and performed at Cornell University, the University of Colorado at Boulder, and Bucknell University. Before joining The Philadelphia Orchestra, he was principal second violin of the Rochester Philharmonic, with which he made numerous solo appearances. He is a founding member of both the Society Hill Quintet and the Dalihapa Ensemble and is a regular participant with the Network for New Music, an ensemble with which he has recorded. For six years years Mr. Arnold served as music director of the Philadelphia Museum of Art’s Philadelphia Orchestra Connection Series, showcasing his colleagues and their associates in musical programs pursuant to current Museum exhibits. Most recently Mr. Arnold was featured in a documentary included as the intermission feature of a Philadelphia Orchestra Global Concert Series transmission. The film focused on his arrangement of a Beethoven piano sonata for his string quintet and included a conversation with Mr. Eschenbach on Beethoven and the nature of transcriptions. Mr. Arnold is a member of the Board of Overseers of the Curtis Institute of Music. An avid photographer, he has given shows in Saratoga, New York, summer home of The Philadelphia Orchestra. For the last 15 years he has been an active lecturer on musical subjects and has given scores of PreConcert Conversations for The Philadelphia Orchestra. His series “I have a friend in the Orchestra” has delighted concertgoers and has endeavored to break down barriers and enhance the audience’s full enjoyment of the musical experience. Scott joined the Main Line Symphony in 2016, and along with William Einhorn, was appointed assistant conductor with the orchestra beginning with the 2018-19 season. Scott is principal trombonist with the New Holland Band, and the Chester County Pops Orchestra, and is active as a trombonist in regional ensembles including Orchestra Concordia, Allegro Orchestra Lancaster, and the Lancaster Brass Quintet. Scott is the Associate Conductor of the Pennsylvania Symphonic Winds, has served as co-director of the Chester County Youth Wind Ensemble, and has conducted the Chester County Pops Orchestra as well as the Wind Ensemble, Wind Symphony, and Concert Band at West Chester University. Scott earned his Bachelor’s and Master’s degrees in music education from West Chester University in 2001, and 2009. He earned a second Masters degree at WCU in music performance in wind conducting in 2015. He has since attended master classes in wind conducting at Temple University and West Chester University, working with conductors Dr. Andrew Yozviak, Dr. Gregory Martin, Dr. Kevin Sedatole, H. Robert Reynolds, Dr. Emily Threinen, Col. Arnald Gabriel (ret) and Michael Haithcock. Scott Cullen teaches instrumental music for grades 7 through 12 for the Octorara Area School District. Mr. Cullen joined the music department at Octorara in 2002 and teaches high school music electives such as guitar, piano, music theory, and music appreciation, in addition to teaching middle school band, high school band, high school marching band, and high school jazz band. 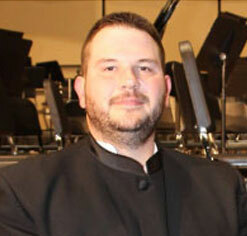 William Einhorn currently serves as the Orchestra Director for Pottsgrove School District. Mr. Einhorn joined the Pottsgrove Music Department in 2009. Prior to that he served as an Orchestra Director for Cecil County Public Schools in Cecil County His current responsibilities include directing the Pottsgrove Middle and High School Orchestras as well as teaching string lessons. He also conducts smaller chamber ensemble groups at Pottsgrove High School and the pit orchestra for the High School Musical. As a violist, William has been performing for over 25 years. He is a frequent guest performer with the First Presbyterian Church of Pottstown and performs in smaller ensembles for weddings and the holidays throughout the area. He joined the Main Line Symphony in the Spring of 2011 and was appointed Principal Viola in the Fall of 2011. William's has studied orchestral conducting privately with Dr. Ovidiu Marinescu of West Chester University and has taken conducting masterclasses with Dr. Peter Boonshaft, Hofstra University, and David Hayes, Mannes College. William is originally from Cherry Hill, NJ. He began his viola studies in 1992 and attended West Chester University where he graduated in 2006 with honors with a Bachelor's Degree in Music Education. He is currently pursuing his Master's Degree in Orchestral Conducting from Messiah College. Outside of music, he is devoted to his wife Wendy, daughter Elizabeth, and his cats. William is also a lifelong dedicated Philadelphia sports fan. In his spare time, he enjoys playing cards with friends and golfing. Mr. Einhorn's organization affiliations include the Pennsylvania Music Educators Association, the National Association for Music Education, and the American String Teacher's Organization.